Since Intel introduced its Hyper-Threading technology with its Pentium 4 microprocessors back in early 2002 reviewers have occasionally noticed that under certain conditions Hyper-Threading can actually hurt performance instead of helping it. A quick summary of this issue with Hyper-Threading can be found over at Bitsum. 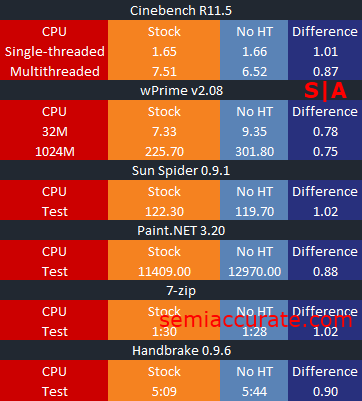 We decided to explore the effects of Hyper-Threading on the performance of the Ivy Bridge based Core i7-3770K by running our CPU benchmarking suite on it twice. Once with Hyper-Threading enabled, and once with Hyper-Threading disabled. As such we set-up our results table to look for applications that perform better with Hyper-Threading disabled, rather than enabled. As you can see there are a few applications that perform marginally better, to the tune of one to two percent, with Hyper-Threading disabled. But at the same time there is far more to be gained in terms of performance from leaving Hyper-Threading enabled than there is to be gained from disabling it. On average the 3770K with Hyper-Threading disabled offers only 90 percent of the performance of the same chip with this feature enabled. Thus it stands to reason that leaving Hyper-Threading enabled is the best choice for consumers. Updated: Monday April 30th 10:10 AM. Replaced image with corrected image per forum member notes.